The meeting page in TouchPoint is full of information, not only about the meeting itself, but also about those attending. Notice that the Meeting Type is Regular|Every Meeting. This means that we are recording attendance for the individual Members of the class, not just entering a Headcount attendance. You can click on either of those parts of the Meeting Type if you need to change it. Orgs with multiple schedules will have different options: Every Meeting; Once a Week. This part of the header is where you find the Add Guest button as well as the blue Toolbar. You see the attendance counts: Members = 49, New Guests = 1, Present = 50. A Headcount was added, making the total attendance = 51. You can click in the HeadCount box to enter a total if the number present in the class is more than you can account for with the members and any guests or visiting members. If there were other attends for this meeting, they would not be included in any count as they are not attending this meeting, but are already counted present elsewhere. If your church has the HeadCount disabled, you will need to change the Meeting Type to HeadCount in order to enter a headcount total. We have a shortcut for enrolling all guests who attended a specific meeting. While on the meeting page, select Operations > Add All Guests to Org from the blue Toolbar under the gear icon. You will see a prompt asking if you want to make all the guests members. Answer ‘Yes’ and all of the guests who attended that meeting will become members of the organization. Remember, at the time someone attended, he would have been a guest, so his Attendance Type will not change for that meeting. The next time he attends, it will be as a member, not a guest. We find this very helpful during VBS. We use TouchPoint Check-In and add these children as guests, so the parent gets a location label, the child gets a label to wear, and the teacher gets a label to affix to the roll sheet. 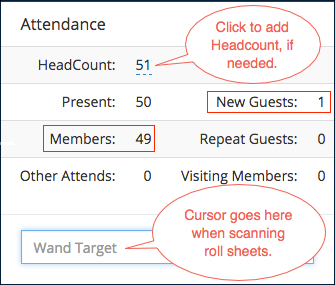 Then we make them all members on the meeting page using this shortcut when we record attendance using the wand scanner. Here is a screenshot of the Member list portion of the Meeting page for an Organization after I selected Enable Editing and Enable Register . Notice the column headers (which are explained below) and the Attend Member Type and its corresponding Attend Type. If, for some reason, the absentee records do not get created for a specific meeting, you can add those by using an option from the blue Toolbar. When you are on the page for that specific Meeting, select the gear icon > Add Absents to Meeting . This will mark everyone absent who is a member at the time of the meeting and who has not already been marked present. This is available to Admin users only. This will not affect those with an Off-Site attendance. When you click the checkbox (either manually, with a barcode scanner or at check-in) it indicates a person attended that Meeting. This column only displays when you select Enable Register while viewing the Meeting. The settings indicate a person’s commitment status regarding that meeting. For most meetings, this is not used and the status will be Uncommitted. You can manually change the commitment to one of the options below by clicking on the word displaying in this column, making a selection, and then clicking OK. The first 2 options relate to RSVPLinks and RegretsLinks. Attending relates to an online registration that used a check box or drop down containing a Date/Time to create a Meeting. The next 3 relate to Organizations set as a Volunteer Calendar. Uncommitted is the default. When the Commitment is set to Attending, it does not give the person credit for attending. You would actually need to mark them present (Attended column) to record their attendance. The person’s Member Type within that organization at the time you view the meeting. The Member Type at the time the attendance was recorded. Both new and recent guests will have an Attend Member Type of Guest. There will be a 1 in that column if a member is not marked Present but has attended elsewhere at that same Meeting time. As on most pages, the blue Toolbar is located on the meeting page. You can send email, run reports, and more. We have many other help articles relating to meetings, attendance and attendance reports. Be sure to check those out. Here are a few.